IPE is one of the hardest, strongest, most stable and fire resistant woods in the world. Environmentally, new Brazilian laws are ensuring sustainable harvest practices. 50-100 year in service life span, as well as being naturally biodegradable, makes this one of the greener deck products available. 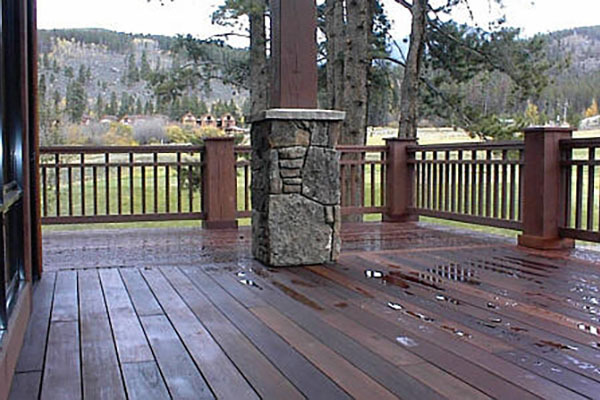 It is a low/no maintenance decking product with a class-A fire rating. Very resistant to mold, mildew and fungus, it has no knots and is three times as hard as Oak. You won't find a better performing, longer lasting hardwood deck than IPE. SPACING: When using kiln-dried products, leave a 1/4" minimum spacing between 6" boards and a 3/16" minimum spacing between 4" boards. FASTENING: When screwing at the extreme end of a board, you may wish to pre-drill to reduce the possibility of splitting. Do not over screw! Screws should be driven flush with the surface of the deck otherwise you create a hole which could hold water or dirt. Two screws in the face will always give the most holding power. Hidden deck fastener systems are also available. Hidden deck fasteners do not have the holding power of two screws in the face but they do have a cleaner look with the screws out of sight. STAINING & FINISHING: We recommend Messmers UV+ semi-transparent stain. This is a penetrating natural stain which contains ultra-violet blockers and provides an excellent level of penetration and protection from the elements. Paints and solid stains are not recommended. Light colors are recommended over dark shades because they do not absorb heat as readily and will not become two-toned in high traffic areas.